RN一直没有稳定的版本, 在0.50.1版本遇到了好多问题, 只好期待能够在0.52.3上有所改进, 所以进行了一系列的升级. 结果升级之后, 遇到各种问题. 以上两个错误是react的依赖boost和folly没有安装上, 之前根据论坛里的这个帖子使用下载好的这几个库, 放到~/.rncache里还是不行, 删掉重来几次就好了, 这几个库即使让terminal代理http/https还是很困难才能下载下来. 4. 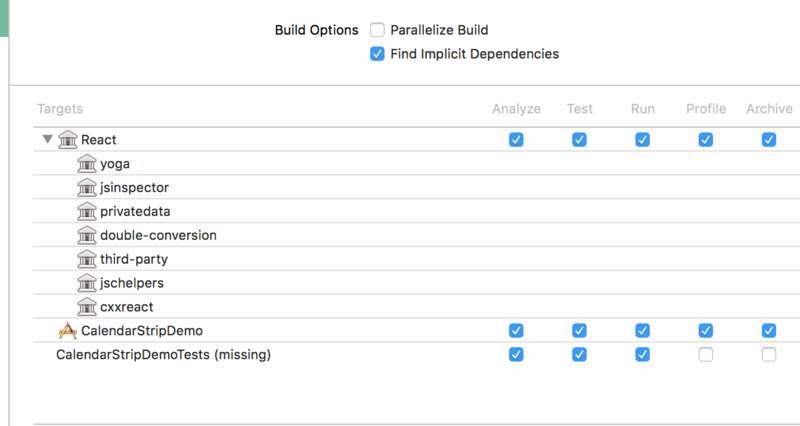 Argument list too long: recursive header expansion failed at Project/nodemodules/react-native-fabric/ios/../../../ios/Pods/boost/boost/bimap/containeradaptor. 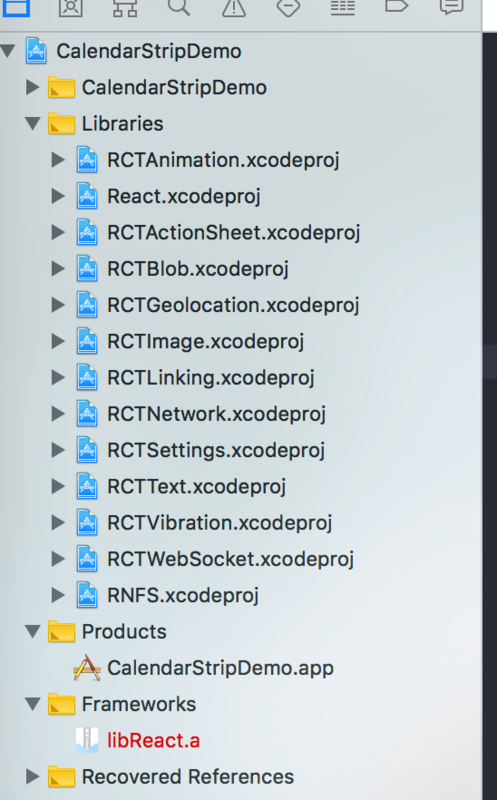 新建一个iOS项目, 都会给你创建一个.xcodeproj文件, 这个就是PROJECT, 它是文件/资源/编译结果/编译产出的容器, 它可以包含多个target, 并且组织这些target如何编译. 新建项目一般都会创建一个项目名的target和tvos的target, 可以设置一些默认的编译选项, 让所属的target继承这些编译属性, target也可以选择override这些属性. 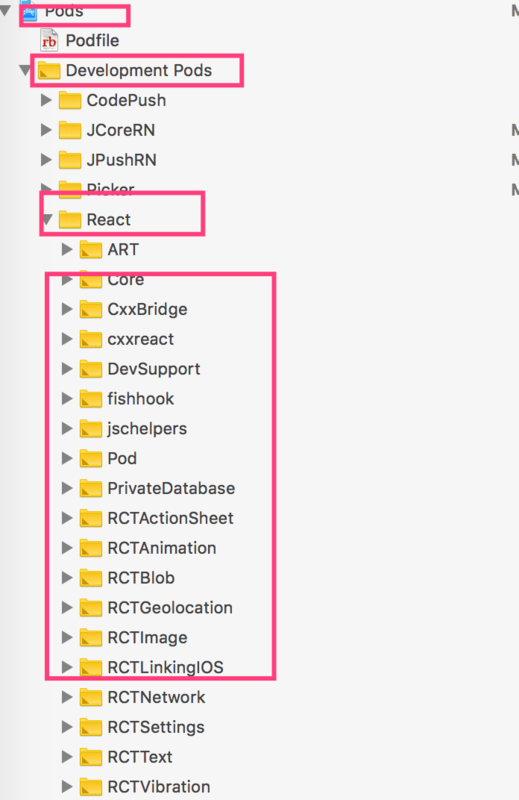 首先需要执行安装 $ yarn add react-native-fs, 它会将npmjs上的package拉取到项目node_modules下. 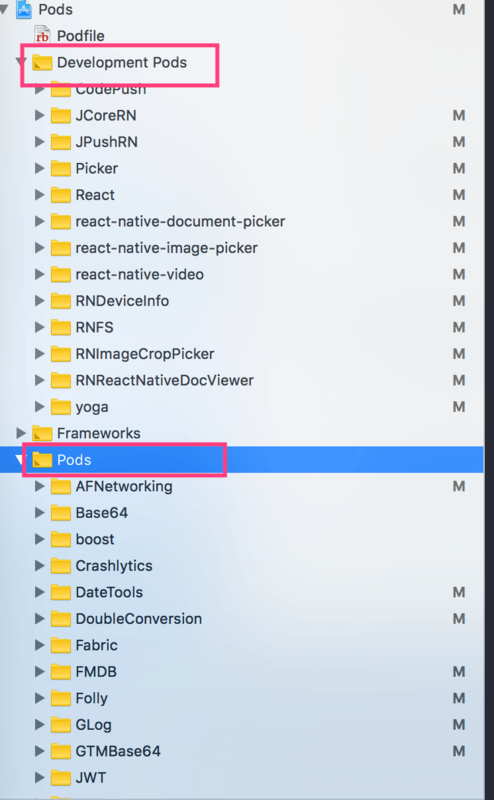 由于RNFS使用到了原生代码, 所以可以用 $ react-native link react-native-fs 自动链接. 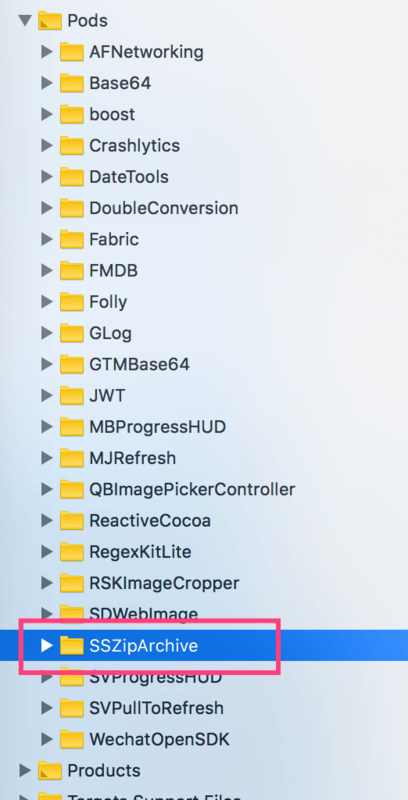 它会自动将node_modules/react-native-fs/下的RNFS.xcodeproj添加到Library下, 并且将 libRNFS.a添加到Linked Frameworks and Libraries下, 最后将Header Search Path添加一行 $(SRCROOT)/../node_modules/react-native-fs (recursive). 再次编译运行就可以使用RNFS了. 如果一个rn第三方库只需要js代码来调用, 原生从来不用, 那么就不需要添加Header Search Path. 这样再执行 $ pod install, Pod就会自动将所需要的文件根据node_modules/react-native-fs下的RNFS.podspec下载放好. 那肯定是有些Header Search Path 或 Framework Search Path配置有问题. 像这种项目中依赖很多其他第三方的.xocdeproj, 编译这些依赖, 产出它们的target编译结果.a, 这种方式简直弱爆了, 所以就有了CocoaPods. 执行 pod install 会根据Podfile下的依赖自动下载并放到指定位置, 项目由一个.xocdeproj升级为.xcworkspace. 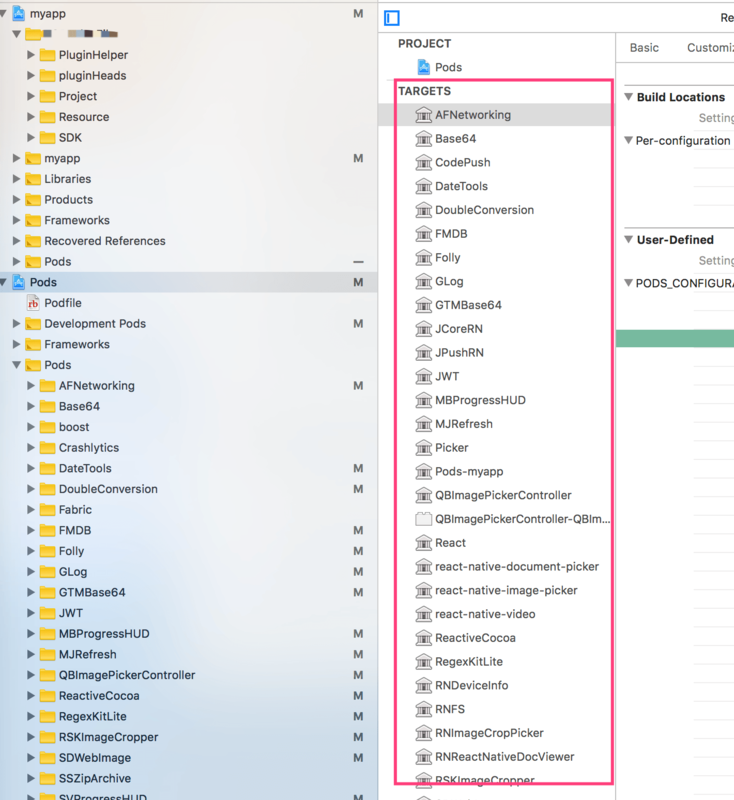 Pod下分为Development Pods和Pods, 其中Pods是可以在ios/pods文件夹下找到所对应的依赖文件, 而Development Pods是引用了node_modules/下的具体依赖. 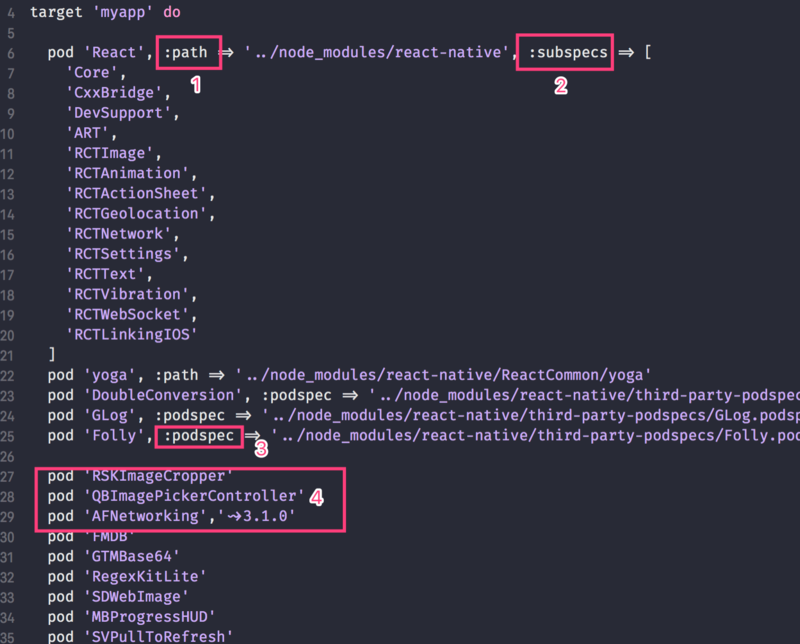 而 pod 'yoga', :path => '../node_modules/react-native/ReactCommon/yoga'则会根据node_modules/react-native/ReactCommon/yoga路径下的yoga.podspec来下载依赖. 放到Development Pods下. 而 pod 'GLog', :podspec => '../node_modules/react-native/third-party-podspecs/GLog.podspec'会根据这个路径下的GLog.podspec去下载相应的依赖放到Pods文件夹下.